We could hear them from what seemed like miles away. We had spent a glorious day at Crater Lake, OR. Now that’s a phenomenon of God for sure. When a volcano erupted eons ago, not only did the mountain blow its top. It also imploded as lava poured out down below, forming a huge crater. Believe me, the water is the most intense blue I have ever seen. As Indian legend says, “The mountain bluebird was gray before dipping into the waters.” But I digress. The scenic drive from Crater Lake to the Oregon Coast led us along narrow winding roads bordered by rising rock walls, under a lush canopy of green. Finally we were at the Pacific. The sea cliffs fell sharply to the ocean below. Our ears were assaulted by a loud barking cacophony. 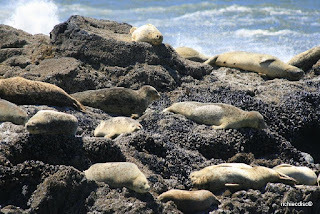 It took us some driving along the coast to get to the perfect vantage point to view, up close, the colony of sea lions making the racket. What strange mammals these sea lions are. Their bodies are streamlined for swimming at speeds up to twenty-five miles per hour. On land they sidle along like inchworms, their long fore-flippers alternating with the rear. They lie right next to each other like best friends, but just try to take over their spot on the rocks. You’ll be back in the water in a flash. They seem to spend all day long doing nothing but sunning themselves. And what’s the matter with that? God created them to relax and enjoy the hot sun. Just maybe that loud bark was their way of praising Him for a good job done. Besides, adjacent to their sunning rock lies Cobble Beach, composed of round black basalt rock. As the waves roll onto the beach, one can hear an applause-like sound. Hmmm—is the water, are the rocks, also praising God? Makes me want to spend a little more time sunning in the presence of the Lord. If we all sang His praise from the ends of the earth, think what a sound that would make.